Toshiba White Laptop L50D 15.6" Window 8.1 AMD A4-6210 Quad Core 8GB RAM 500 GB. 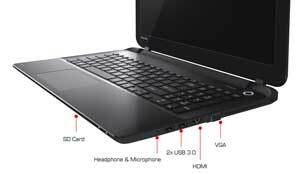 This ultra-slim and light weight laptop is ideal when you need to multitask on the move. With a wide range of multimedia options and connectivity ports it gives you all you need to connect to your world. Its 10 point multi touch screen gives you an amazing experience when used with Windows 8.1. This superb laptop is slim on design but big on features. Its large touchups and frameless tile keyboard gives you all the comfort and style you always wanted. Being just 23 mm thin and weighing 2.2 kg, it is highly portable and you can take your work and entertainment everywhere without carrying a bulk. 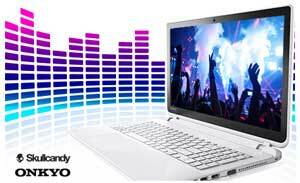 Toshiba L50D combines Skullcandy-tuned speakers with DTS Sound so you can experience rich and deep audio. The integrated speakers offer a well-balanced soundstage so you can immerse yourself in realistic sound while playing game or watching movies. DTS Sound features a sound-enrichment suite that boosts volume, enhances bass and improves definition. It lets you listen clear dialogues with deep bass. By delivering high frequency it lets you enjoy natural listening experience through speakers and headphones. It offers you 1 TB of storage so you never run short of storage capacity. 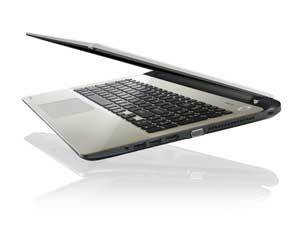 Equipped with AMD processors, which offers low power consumption, Toshiba L50D becomes best choice for mobile computing. When used with Windows 8.1, you can take most out of your laptop. It saves your time and gives you faster access of your content as it lets you put your applications sites, and other things right on the start screen. 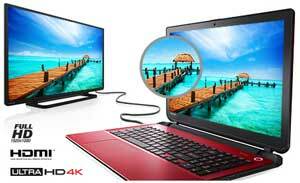 Toshiba L50D comes with an integrated HDMI port. It enhances your comfort and usability by letting you connect your laptop to projector or HDTVs. It lets you enjoy your media in better quality and large screen with easy connection. You only need one cable for the connection, making connecting your laptop easier and tidier. 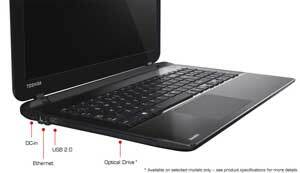 The Toshiba L50D also comes with one USB 2.0 port and two USB 3.0 ports. USB 3.0 makes your data transfer much speedy as it gives you ten times faster data transfer rate than USB 2.0. Featuring Bluetooth 4.0, it lets you easily and quickly share your data with other devices. So upload your photos or share your media wirelessly. It is also ideal for connecting compatible devices like smartphones, MP3 players, and more. With Toshiba L50D, no need to carry extra chargers and adapters with you. It features Sleep N Charge USB port through which you can easily charge your mobile phones MP3player and other devices even when the laptop is off.